Deafbindness can occur for a variety of reasons. Some people are born deafblind while others loose one or both senses later in life, either suddenly or gradually. People who are congenitally deafblind are hearing and vision impaired from birth. As a result, their communication and language skills can be limited and intellectual and other disabilities are often present. Some causes of Congenital deafblindness include prematurity pre and post-natal complications, viral infections such as rubella and rare genetic conditions including CHARGE Syndrome. Acquired deafblindness occurs when a person loses their vision and hearing, either gradually or suddenly, during development or in adulthood. While the diagnosis of sight and hearing loss can have a significant emotional impact, many people with acquired deafblindness lead active, independent and fulfilling lives. Acquired deafblindness can be related to a specific genetic condition from birth that wasn’t detected until later in life, or occur as a result of illness or an accident. Age-related deafblindness is the most common cause of acquired deafblindness followed by Usher Syndrome. Acquired deafblindness in old age represents by far the largest group within the deafblind population. International research suggests that over two-thirds of people with a combination of vision and hearing loss are over the age of 70. In Ireland, 1050 of the 1749 people with a combination of serious vision and hearing impairments are over the age of 65. As a person ages their ability to hear and see well can gradually become compromised. Older people often consider hearing and sight loss as a natural part of the ageing process and as a result, don’t always see themselves as ‘deafblind’. Acquired deafblindness is also likely to be under diagnosed and in some cases the impact of dual sensory loss can be confused with cognitive decline or dementia. As people live longer and the number of older people rises, so too will the number of people who are deafblind. It is important that older people have access to supports that will help them to adjust to dual sensory impairment and will enable them to live independent and fulfilling lives. If you are an older person who has a combination of vision and hearing difficulties click here to find out more about how we can help support you. Rubella is a mild and preventable disease caused by a virus. Symptoms include swollen glands, a slight temperature, or a sore throat and rash. If a woman contracts Rubella in the early stages of pregnancy however, her baby can be affected by a condition known as Congenital Rubella Syndrome (CRS). The condition can impact on a child’s ability to see and hear and also cause developmental delay. Congenital Rubella Syndrome was once the leading cause of deafblindness around the world but the availability of the MMR vaccine, since 1971 onwards, has resulted in a dramatic decrease in the number of children being born with CRS. In the UK, fewer than 3% of women are now susceptible to being infected by Rubella and in Ireland the number of reported cases of Rubella has fallen from 3304 in 1961 to 4 in 2011. CHARGE is a rare condition that can affect different parts of the body. The most common problems are with the eyes, ears, heart, nasal passages, feeding and growth – although the condition, and its severity, does vary from person to person. It estimated that 4 – 6% of the deafblind population are deafblind as a result of CHARGE Syndrome. In Ireland, more than 10 families affected by CHARGE have recorded their details on the National Registry of People who are deafblind established in 2014. Despite the many obstacles that face children diagnosed with CHARGE Syndrome many go on to lead full and active lives. Sense, the UK’s leading deafblind charity, have produced an invaluable information pack complete with a number of helpful factsheets for families affected by CHARGE. To access the information pack click here. Usher Syndrome is now the most common cause of deafblindness worldwide, after age-related deafblindness. Typically, a person with Usher Syndrome is born Deaf or Hard of Hearing and experiences progressive sight loss due to Retinitis Pigmentosa (RP). Symptoms include night blindness a gradual narrowing of visual field and eventual loss of sight. The severity of the deterioration and speed that sight loss progresses varies from person to person. The eye is often compared to a camera. The front of the eye contains a lens that focuses images on the inside of the back of the eye. This area, called the retina, is covered with special nerve cells that react to light. Approximately 3–6% of all children who are deaf and another 3–6% of children who are hard-of-hearing have Usher syndrome. Studies performed in Northern Europe have revealed rates of 3.5 per 100,000 (Finland) and 6.2 per 100,000 (Heidelberg, Germany). In the United States, about 4 in every 100,000 births have Usher syndrome. To put the figure in context, it is interesting to note that 2 in every 100,000 people are diagnosed with Motor Neuron Disease – the cause for which the Ice Bucket Challenge was dedicated in 2014. If the 4 in every 100,000 formula is applied to Ireland, almost 300 people are estimated to be affected by the syndrome. What can a person with Usher Syndrome see? What Causes Usher Syndrome? The Sciencey Part! A gene is an ‘instruction’ made from the chemical DNA which tells the body to make something (a protein). We have 20,000 pairs of genes in every cell of our bodies and we have millions and millions of cells. This means that we cannot remove a ‘bad’ gene and replace it with a ‘good’ gene. Scientists have identified more than 10 different genes that can cause Usher Syndrome. Each person inherits two copies of each gene, one from each parent. A ‘misprint’ (a gene ‘mutation’) in both copies of any one of those 10 genes means that the correct protein that is needed in cells of the inner ear and in the retina is not made in the body. 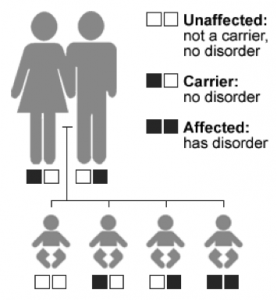 Usher syndrome is inherited as a recessive trait which means that an individual must receive a mutated form of the Usher syndrome gene from both parents. If a child has a mutation in one Usher syndrome gene but the other gene is normal, he or she is predicted to have normal vision and hearing. Usually, parents who have normal hearing and vision do not know if they are carriers of an Usher syndrome gene mutation. Because Usher syndrome affects hearing, balance, and vision, diagnosis of the disorder usually includes the evaluation of all three senses. Evaluation of the eyes may include a visual field test to measure a person’s peripheral vision, an electroretinogram (ERG) to measure the electrical response of the eye’s light-sensitive cells, and a retinal examination to observe the retina and other structures in the back of the eye. A hearing (audiologic) test can measure how loud sounds at a range of frequencies need to be before a person can hear them and an electronystagmogram (ENG) can measure involuntary eye movements that could signify a balance problem. Currently, there is no cure for Usher syndrome. However, scientific researchers around the world are making significant advances in treating hearing loss and the retinal degeneration experienced by people with Usher Syndrome. There are also a growing number of treatments available that facilitate people with Usher Syndrome to live independent and fulfilling lives. The exact nature of these treatments will depend on the severity of the hearing and vision loss as well as the age and abilities of the person. Typically, treatment will include hearing aids, assistive listening devices, cochlear implants, or other communication methods such as Irish Sign Language; orientation and mobility training; and communication services and independent-living training that may include Braille instruction, low-vision services, or auditory training. To learn more about how people who are deafblind communicate click here. Technological advances in the last few decades have also greatly enhanced the range of communication devices and aids available to people with vision and hearing difficulties. The Anne Sullivan Centre is committed to developing accessible, inclusive and worthwhile training and support programmes for people with Usher Syndrome in Ireland. We are particularly interested in engaging with people who have Usher Syndrome and their families to ensure that they can contribute to the development of programmes to meet their needs. If you would like to get involved please contact cmcdonald@annesullivancentre.ie or click on the Join our Registry link and add you details. The Usher Syndrome Coalition’s was set up to raise awareness of Usher Syndrome and accelerate research for the most common cause of combined deafness and blindness. The coalition maintains a registry of people affected by the condition, which aligns over 650 people with Usher Syndrome across 37 countries, including Ireland. According to the coalition, the greatest fear expressed by researchers working to find a cure for Usher Syndrome is not that they will fail to find treatments. They are confident that they will. It’s that they will fail to get them through clinical trials because they are not connected with enough Usher families. Building the Usher Syndrome Registry is a crucial step towards resolving this problem. If you would like to Join the Registry please click here.